A year after the worst-ever Ebola outbreak was declared over, a new cluster of the disease is suspected of causing three deaths in the the Democratic Republic of Congo. The World Health Organization, which first reported the outbreak last week, said Monday that 19 people are suspected of developing Ebola infections and three of the patients have died in the remote Bas Uele province. Despite attempts to trace contacts and stop the disease, the WHO reported the "national risk" for the DRC is "high." 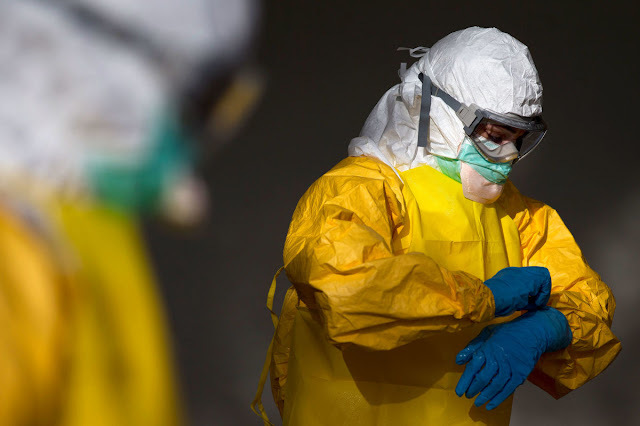 "At this stage, the overall risk is high at national level due to the known impact of Ebola outbreaks, remoteness of the affected area, limited access to health care and suboptimal surveillance," they reported. In an account of the outbreak's start, WHO officials revealed how quickly the virus is suspected of spreading from patient to patient. The first suspected case was a 39-year-old man who arrived at a remote clinic on April 22 with fever, weakness, vomiting, bloody diarrhea and nose bleeds. He was on his way to another health center for further treatment, but died before he arrived. Two days later, the motorcycle driver who transported the first patient and another person who had helped during the transport also developed symptoms. The driver died from the illness on April 26, just four days after the first patient arrived for treatment. Other people who have developed symptoms were "close" to these three patients, according to the WHO. In an effort to stop the outbreak from spreading rapidly, a health team was sent out and is now identifying contacts who may have been exposed to the deadly virus. At least 125 people close to those who fell ill with the disease are being monitored. Isolation centers will be set up in case the outbreak spreads, according to the WHO. Aid groups are also setting up isolation facilities in the event that the outbreak becomes considerably worse. The Ebola virus is a hemmorhagic fever. This marks the eighth outbreak of the deadly virus since it was first discovered in 1976. Starting in March 2014, a massive Ebola outbreak spread through multiple countries including Liberia, Guinea and Sierra Leone. According to the WHO, Nearly 29,000 people were suspected to have been infected and more than 11,000 people died from the virus.